EX trim. FUEL EFFICIENT 34 MPG Hwy/23 MPG City! NAV, Sunroof, Heated Leather Seats, Bluetooth, Keyless Start, Dual Zone A/C, EX TECHNOLOGY PACKAGE, EX PREMIUM PACKAGE, iPod/MP3 Input, Alloy Wheels. CLICK ME! Leather Seats, iPod/MP3 Input, Bluetooth, Aluminum Wheels, Keyless Start, Dual Zone A/C, Heated Leather Seats Keyless Entry, Remote Trunk Release, Steering Wheel Controls, Child Safety Locks, Heated Mirrors. EX PREMIUM PACKAGE Heated & Ventilated Front Seats, Heated Steering Wheel, Driver Seat Memory, Radio: UVO eService, AM/FM/CD/MP3 player, SiriusXM satellite radio, USB/auxiliary input jacks and Bluetooth wireless technology w/steering wheel mounted controls, Infinity Premium Sound System, 8-speakers w/subwoofer, HD Radio, Power Folding Outside Mirrors, Rear Camera Display, Heated Rear Outboard Seats, 4-Way Power Front Passenger Seat, Panoramic Sunroof, Gloss Black B-Pillar, EX TECHNOLOGY PACKAGE Blind Spot Detection w/Cross-Traffic Alert, back-up warning system, Radio: UVO eService, AM/FM/CD/MP3 player, SiriusXM satellite radio, USB/auxiliary input jacks and Bluetooth wireless technology w/steering wheel mounted controls, Infinity Premium Sound System, 8-speakers w/subwoofer, HD Radio, Navigation System SiriusXM Traffic and SiriusXM TravelLink which provides real time info on weather, traffic and sports, Rear Camera Display. Kia EX with Remington Red Metallic exterior and Beige interior features a 4 Cylinder Engine with 192 HP at 6300 RPM*. Blind Spot Monitor, Cross-Traffic Alert, Child Safety Locks, Electronic Stability Control, Brake Assist, 4-Wheel ABS Great Gas Mileage: 34 MPG Hwy. 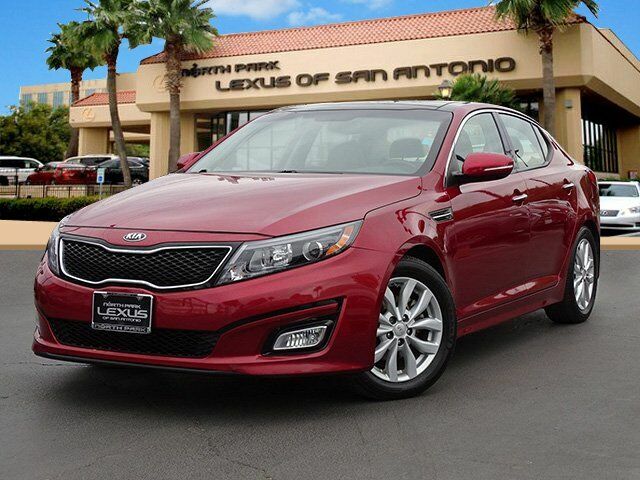 "Inside the 2015 Kia Optima, you'll find a distinctly modern, European-influenced design, as well as good overall interior quality and an abundance of soft-touch materials." -Edmunds.com.